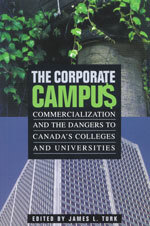 CAUT is pleased to announce publication of "The Corporate Campus: Commercialization and the Dangers to Canada’s Colleges and Universities", edited by James Turk. This is the second book in the CAUT Series. For fifty years, the quality of education offered by Canadian universities and colleges has steadily improved along with access to these institutions. Now these gains are in danger. As tuition fees increase, as colleges and universities make new and often secret arrangements with the private sector, and as courses and research go up "for sale," Canada's universities and colleges are losing sight of the public interest. The articles in "The Corporate Campus" grow out of presentations made at CAUT's conference on commercialization of post-secondary education last October. Authors include Ursula Franklin, Nancy Olivieri, Bill Graham, Paul Axelrod, David Noble, Bill Bruneau, Wayne Renke, Ann Clark, Maureen Shaw, Marjorie Griffin Cohen, Janice Newson, Claire Polster, Michael Conlon, Langdon Winner, and Michelle Brill-Edwards. "The Corporate Campus" sells for $19.95. It is available in book stores, or can be ordered from the publisher by phoning 1-800-565-1975.